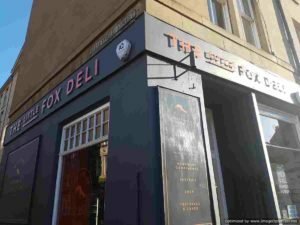 The hunt for coronation chicken excellence took me to Tollcross and a place I’d not visited before called the Little Fox Deli. Their livery is bright orange and their detailing foxy brown. It’s fun and welcoming. This was matched by the welcome from the friendly counter staff. Before I’d ordered I was offered a little sample cup of their seasonal spiced pumkpin soup. It was very good. My focus on the coronation prize was given a jolt when it was announced that their mix contained no raisins due to customers tending not to favour them. I just about managed to hide my fallen crest. With the warming soup fully sampled I was on my way with my fruitless sandwich in hand. With nicely shredded chicken in a sesame seed roll, this was an enjoyable eat. 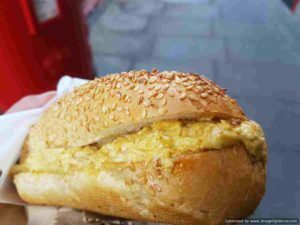 It lacked the fruity notes of true coronation chicken but was a rather good sandwich nevertheless. So overall, I found the Little Fox Deli charming and I enjoyed the food I ate. I must come back and give more of their soup a try as what I sampled was very good. Give it a look when soup and sandwich fare is what you’re after in this part of town.